According to the World Health Organisation, Wellness is defined as an active process of becoming aware of and making choices toward a more successful existence. When one applies this concept to our pets, we must look at this on different levels: physical health; nutrition or diet; fitness & body condition, emotional wellbeing & sociability. 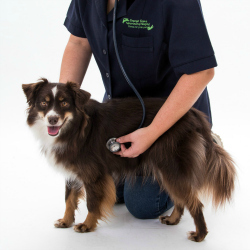 As veterinarians, we focus on the following areas of your pets' general wellness: up to date vaccinations, regular annual or biannual check ups, sterilisation, diet & nutrition, parasite prevention, dental care & senior pet care. There are various diseases against which your dog or cat should be vaccinated, some of which include distemper, hepatitis, kennel cough and rabies in dogs and snuffles, enteritis, rabies and leukaemia in cats. Rabies vaccination is required by law. From approximately 6-8 weeks of age, puppies and kittens are no longer protected by their maternal immunity. It is thus vital that the series of vaccination are started at this age to ensure protection from the diseases mentioned above. Once your pet has been fully vaccinated, it should have sufficient immunity against these viral infections, without which, these diseases could prove fatal. As lots of our viral diseases have high prevalence in South Africa, yearly boosters are recommended to maintain ongoing protection. 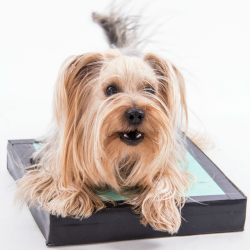 Just like people, our pets general health needs to be monitored throughout their lives. Animals age faster than humans thus health issues appear to present more quickly. At a minimum, veterinarians recommend pet owners bring their pets in for a general health check at least once a year (which corresponds to when their annual vaccinations are due). Biannual check ups are advised for pets older than seven years. When you bring your pet in for a general checkup, your veterinarian will do a full clinical examination from "nose to tail". Checking his or her eyes, ears, teeth, skin, heart, lungs, abdomen, joints, body temperature and more. Your veterinarian might perform further checks on your pets' blood, stool and urine should any concern picked up on initial examination. 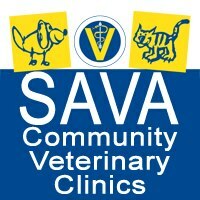 Through regular check ups, your veterinarian will have a better understanding of your pet as an individual. This will also allow subtle abnormalities to be identified, allowing for earlier detection of any health problems thus possibly improving the treatment and prognosis. 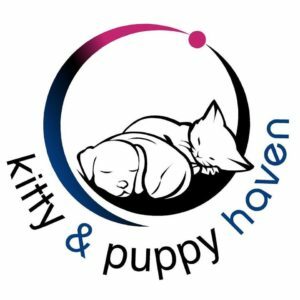 Sterilising your pet has many health and social benefits and is routinely performed at approximately 5- 6 months of age in both cats and dogs. This is not to say that your pet can't be sterilised at a later stage. However sterilising prior to exposure to testosterone and oestrogen will have greater health benefits. 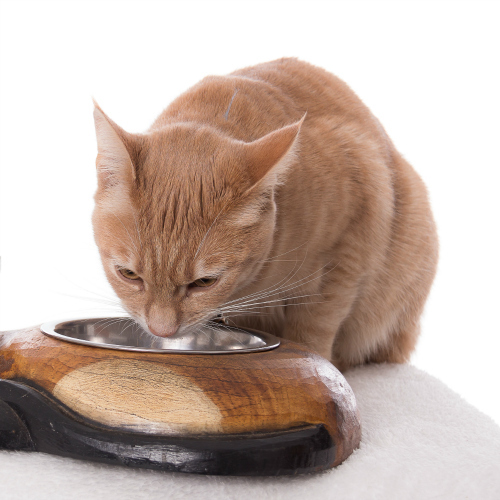 Feeding your pet a good quality food is very important to ensure proper growth & development. 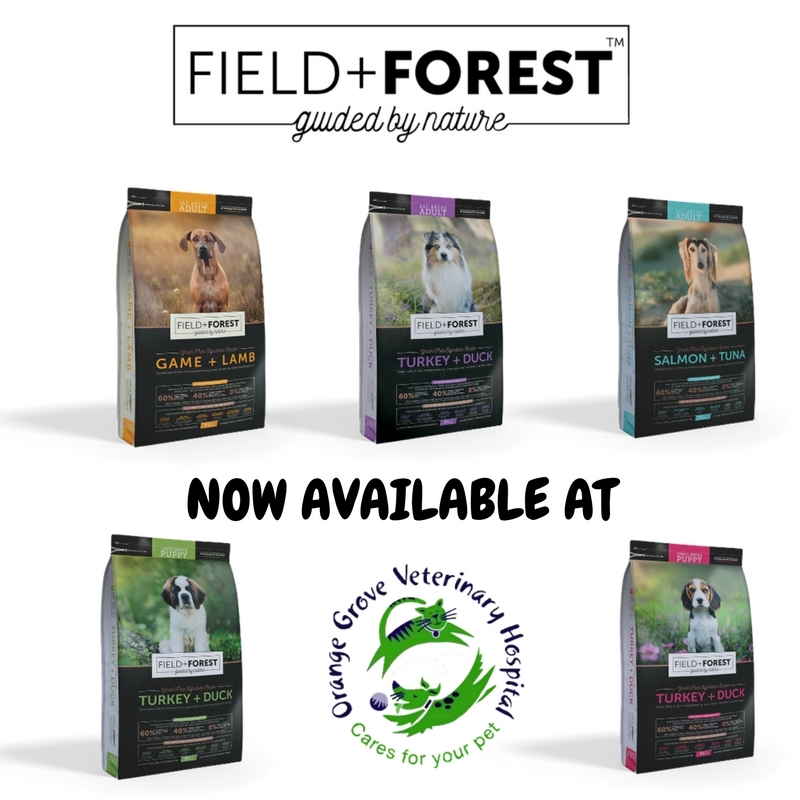 Over the past 25 years the pet food industry has undergone considerable changes and the range of options can be overwhelming for a pet owner. As your veterinarian, we are able to assist you with advice on the best food to suit your budget and pet's nutritional needs. Veterinarians are fortunate that there are even scientifically formulated diets to assist in the treatment and prevention of a range of medical conditions such as osteoarthritis, kidney disease, obesity, cancer & more. Visit Orange Grove Vet and discuss your pet's nutritional needs with our professional staff. 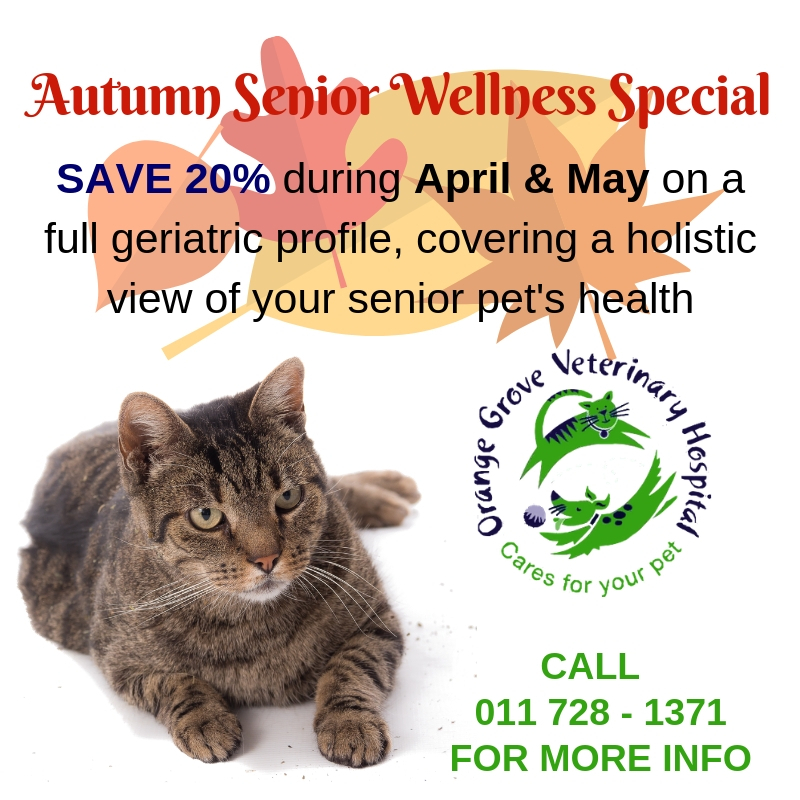 As our pets enter their golden years, they are at a greater risk from a number of health issues. Some of these issues are preventable while others are not. However when early treatment is instituted many health problems are treatable. Common senior ailments include cancer, heart disease, kidney/urinary tract disease, liver disease, diabetes, degenerative joint disease & osteoarthritis, periodontal disease & dementia. 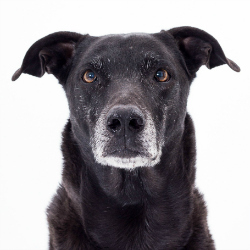 With all of these potential health issues to be aware of, it is important that owners of ageing pets become proactive in their pets health care. Prevention is better than cure and with our older pets, the more proactive you can be with their health, diet and lifestyle, the longer and healthier their lives will be! 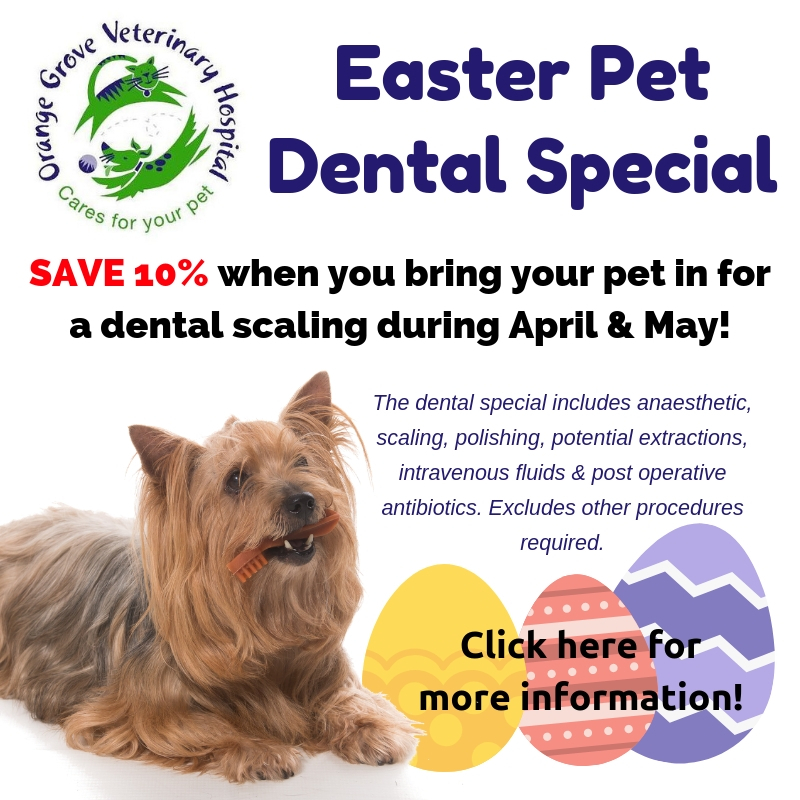 This equates to regular vet visits, feeding an age appropriate diet, regular exercise to maintain an ideal body condition and daily dental care. Other ideas to help your pet is to provide comfortable warm bedding for ageing joints and doggy jerseys during the cool winter months! Common types of internal parasites which our pets are exposed to include: round worm (Toxocara), hook worm (Ancylostoma), whip worm (Trichuris vulpis) and tapeworm. Additionally, in certain regions of South Africa, pet owners should also be aware of Spirocera lupi. 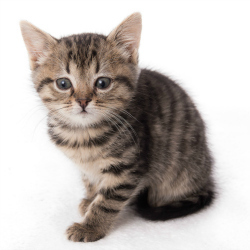 Deworming should be done monthly for puppies & kittens from 2 weeks of age up until 6 months of age. For adult dogs and cats it is recommended to deworm every 4 -6 months. If your pet is regularly exposed to other animals e.g. 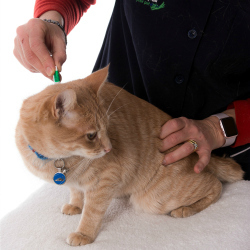 going for walks in public parks, dog training or your cat is an avid hunter and regularly brings home its prey, it is recommended deworming is done more regularly.